A Govini report says U.S. government investments in space and hypersonic technologies from fiscal years 2011 through 2017 reached approximately $83 billion and annual government spending on such platforms rose by 6 percent over the period, SpaceNews reported Sunday. United Launch Alliance ranked first in the top 15 vendors list for FY 2017, followed by Boeing (NYSE: BA) and Lockheed Martin (NYSE: LMT) at the second and third spots and SpaceX at the fourth place. 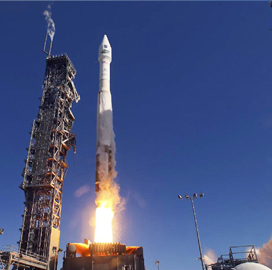 “ULA leveraged its presence in the medium-lift market subsegment to capture $14.6 billion in federal unclassified contracts from FY-11 through FY-17,” according to the Govini analysis. The report said the Boeing-Lockheed joint venture got 49 percent share of the total launch services market and saw its average per contract obligation value climbed to $23.6 million in 2017, up from $10.1 million in 2011. Other companies and organizations mentioned in Govini’s Space Platforms & Hypersonic Technologies Taxonomy report include Iridium Communications (Nasdaq: IRDM), General Dynamics (NYSE: GD), Harris (NYSE: HRS), Raytheon (NYSE: RTN), United Technologies Corp. (NYSE: UTX) and Johns Hopkins University Applied Physics Laboratory.